A few days ago this message hit my inbox from Jean Van Roy of Cantillon in regards to The Brussels Gueuze Museum … I thought I would pass it along. He asks that you contact him at this link with any questions. Message to our loyal members and to all fans of Cantillon Brewery! Like every year around this time, I very much hope to see every member of our organisation renew his or her membership by paying the associated fee for the following year. For the first few years after the Brussels Gueuze Museum was founded, the “Membership dues” item on the museum’s balance sheet accounted for a significant portion of its income. Over time, however, the number of visitors continued to grow and this of course increased the amount of money collected through entrance fees. The result of this is that today the funds brought in through annual membership dues has become ridiculously small compared to the income generated by visitors to the brewery. Yet despite this, in my eyes, actually in my heart, I look at your continued commitment as a token of friendship, acknowledgement and trust, and certainly not as a financial contribution intended to shore up or grow the museum’s assets. We need this friendship, this loyalty, as it gives us the strength to continue in our endeavours. For this reason, I truly hope to be able to include your name and address in my membership list for 2012. As regards the membership fee itself, are you ready for something truly original? We have decided to reduce the minimum amount from EUR 12 to EUR 10 for Belgian members and from EUR 13 to EUR 11 for members living abroad. The maximum amount naturally continues to be “at your discretion”. And if you want to know why we’re rolling back dues, well let’s just say that I hate to see the price of French fries stay the same while potatoes get cheaper. Some of you have been supporting our organisation since its inception in 1978, and yet others have joined us along the way. However, new members are few and far between and among the 125 museum members in 2011 there was only one lady who was not already with us the year before. Clearly, our organisation is losing members each year and if we take a closer look at the figures we see that the best performance dates back to 1994 with 287 people. This is not a very positive trend, all the more so as in the meantime Cantillon Brewery has been building up a reputation and its products have become more and more popular throughout the world. And here I’d like to point out to all the brewery’s fans that this is a business which just barely avoided bankruptcy in the early 1970s. Back then, I thought it would be a great idea to showcase the marvellous process of spontaneous fermentation as well as the related tools and equipment. Following on from this, several cultural events served as the foundation for increased awareness-raising about this traditional industry. 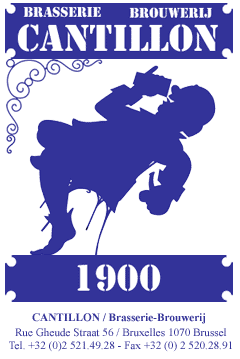 Then, in 1978, the crowning achievement of this small revolution in brewing circles was the creation of the non-profit organisation Brussels Gueuze Museum. So basically what we’re saying now is all you Cantillon fans out there, come and join us! By becoming a member you will show us that you acknowledge our efforts and that we made the right choice 40 years ago. Please note that I would be happy to personally assist anyone who would like more information about our non-profit organisation. Membership in the Brussels Gueuze Museum includes receiving a personalised newsletter every 4 months to keep you informed of our activities, as well as an invitation to the general meeting at the end of January to discuss the cultural and financial events of the past year. Happy New Year to everyone, and thanks again for your loyalty. Thank you for your loyalty and your confidence. To be paid into the account of the asbl Musée Bruxellois de la Geuze: 310-0078340-50. We remind you that members enjoy free access to the museum, tasting included of course. They get a discount when they buy beer, wine, cheese or marmalade and they get a special rate on the occasion of the Brewing Quintessence.